DID A DYING PRINCE ALBERT SAVE A DYING UNITED STATES? I’m currently reading a new non-fiction book that may interest some of you. 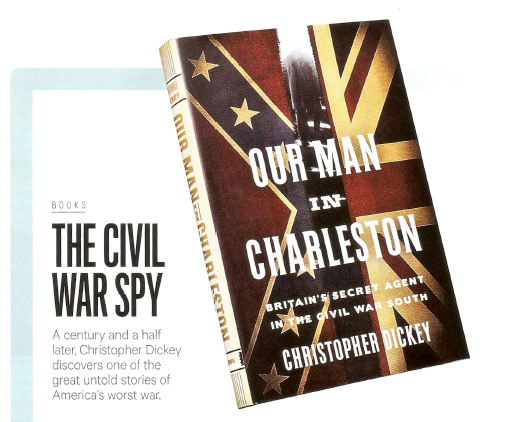 It tells the story of the British Consul in Charleston, South Carolina, in the years leading up to and into the US Civil War (1861 to 1865). When southern states seceded from the United States, the hope across the Confederacy was that they would receive support from the British government. Britain was the greatest power in the world at the time and had the most powerful military. They had a great deal of support in the British press. British commercial interests strongly suggested the United Kingdom would support the South – the UK was the biggest importer of southern cotton, which was needed to feed the clothing factories in the North of England. The British government’s Consul in Charleston was Robert Bunch, who lived in the city with his wife and children. His instructions were to ingratiate himself with prominent citizens and report to London. His reports to the British government, via the Ambassador in Washington, Lord Lyons, were highly influential in determining Britain’s attitude toward the breakaway republic. Great Britain had abolished the slave trade in 1807, the first major power to do so. With the world’s most powerful navy, the British took it upon themselves to stop vessels on the high seas and free any slaves they found. The US followed one year later, but American vessels continued to transport slaves from West Africa, where African leaders continued the practice. These slave ships transported people in the most horrible conditions, many dying en route. The Royal Navy’s ships were kept busy along the West African coast throughout the nineteenth century. Bunch was repulsed by slavery and by those who kept slaves. But he hid his feelings extremely well, as he mixed with leading Charlestonians in the 1850’s. The people around him thought that he sympathized with them and their “peculiar custom” of slavery and would support the South when it broke away from the North. But he was, in fact, sending back to London reports on the brutality of slavery, reports that made it impossible for London to show any support for the Confederacy. He did his job so well that the US Secretary of State, William Seward, pressured the British government to remove Bunch from Charleston as he was a “known” secessionist! In late 1861, there was a major crisis between Washington and London that almost brought the two countries to war. If that had happened, the UK would likely have recognized the South and the Confederacy would still exist. The crisis was triggered when an American navy steamer, the USS San Jacinto, under Captain Charles Wilkes, boarded a British mail ship, the Trent, and arrested two prominent Southerners who were on their way to London to appeal for recognition and help. The British protested volubly. The British Prime Minister, Lord Palmerston, wrote a seriously threatening note, which would have placed Abraham Lincoln’s Administration in a difficult position and would almost certainly have led to another war between the two great English speaking nations. “Before the ultimatum could be sent, however, it had to be read and approved by the palace. On other occasions this might have been largely a formality, and, indeed, in this case Queen Victoria had other priorities. She was giving a dinner party and did not want it interrupted. But Prince Albert, her beloved consort, begged off from the dinner, saying he felt ill. Feverish with the first symptoms of the typhoid that would kill him a few days later, Albert sat down at his desk to look at the ultimatum, and he did not like what he saw. Palmerston and Russell (British Foreign Minister) were giving Lincoln and Seward no way out. They would have to bend to Britain’s will, release Slidell and Mason (the two Southern gentlemen), and apologize abjectly or face the greatest military power on earth. War between the US and Britain had been averted, thanks to a German prince’s careful editing of a diplomatic note, written in English! If the more strident note had resulted in war between Britain and America, London would have supported the Confederacy and the United States would have been permanently divided. If Prince Albert had not been seriously ill, the outcome of the Civil War could have been very different. The book is an interesting read and gives some fresh insight into the Civil War.